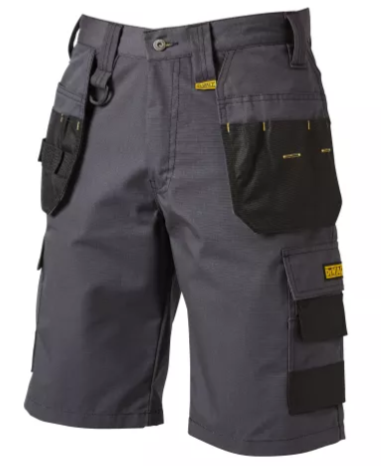 The DEWALT Cheverley Shorts have a durable, rip-stop fabric base, double folded hem and double stitched seams for increased durability and wear. Fitted with a zip fly and top button. It features a variety or reinforced holster, cargo and back pockets. There is also several holster style pockets, enabling you to keep in use tools close to hand. Material Composition: 65% Polyester, 35% Rip-Stop Cotton.